In 1970 when it was first installed, it was state-of-the-art. The Foxboro Control Console (nicknamed “Big Blue”) measured over 20 feet long and weighed in at over 1,000 pounds. 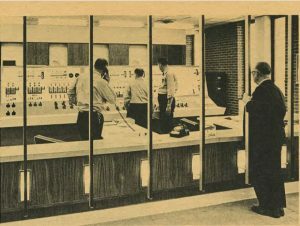 Its switches, dials and analog technology were used to monitor and control the Lake Ontario Water Treatment Plant operation, including rudimentary telephone interconnections with the Raw Water and Clear Water Pumping Stations. For more than 40 years, Big Blue has remained a reliable component of the OCWA water delivery system which distributes up to 60 million gallons per day of clean Lake Ontario water to OCWA’s five-county service territory (Onondaga, Oswego, Madison, Oneida and Cayuga counties). But as with all good things, Big Blue’s time has come to an end. Recently, OCWA completed a pumping and control system upgrade project which transferred all control functions from the Foxboro console to a new digital and secure SCADA/HMI system. The once gigantic electric/pneumatic control system with remote readings through telephone connections has been replaced with a high-tech microprocessor (PLC) based industrial control system, including a licensed radio network for remote communications. Although the original control console has served OCWA and the community well for decades, the time for a new, modern and more reliable control system for the future had arrived. So we say goodbye to Big Blue but hello to smaller and faster means of technology!